After a decade of business and wealth coaching, I have long been convinced that a day spent teaching Rich Dad’s game, Cashflow 101, is the single most powerful thing I can do for my clients. Intellectual and emotional shifts are visible within one exhausting yet exhilarating day. Yesterday was such a day as six members of my Club 100 came to enjoy the free Cashflow day which is included in their membership. 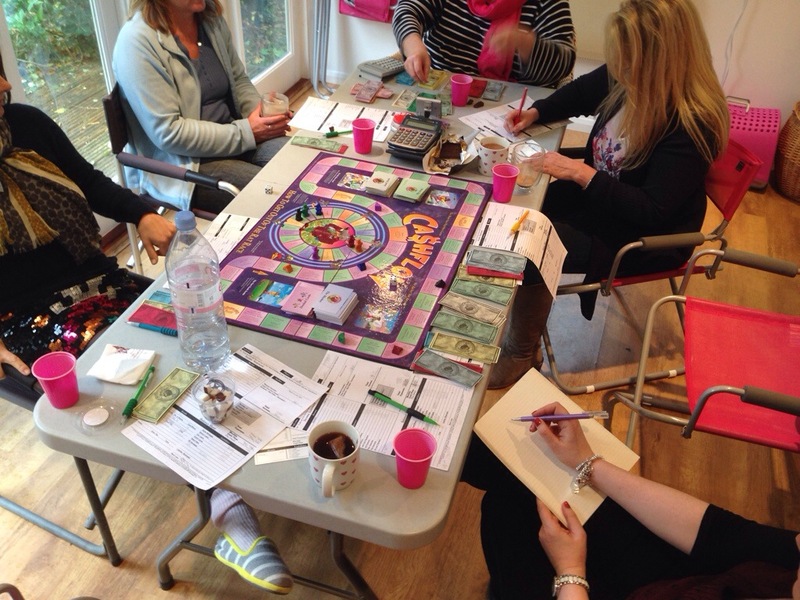 Thanks to Sue Okell, Susie Jones, Soozi Baggs, Sam Dounis, Karen Revell and Diane Leigh for making it a great day in for me; a great day in the Abundance Shed with clients being brave and taking a great leap forward in how they think and feel about their finances. And thanks to Diane for letting me share the photo she took. Sign up to see more of Diane’s pictures which accompany her daily post cards from her travels. Yesterday’s Cashflow players have already been sharing their thoughts and feelings in our Club 100 Facebook group and here’s just some of those, with more to follow no doubt as they continue to process what happened. I LOVED today. Have learned so much about money – the practical stuff of passive income, expenses, and investments. But also much more than I was expecting to learn about my own attitude towards it and my limiting beliefs. 2. Consider every opportunity. Weigh it up. Don’t rush, but don’t question it too long either. Consider the energy, how it makes you feel, your intuition. 4. Big numbers intimidate me. I don’t think in 100 thousands, but I should do. I’m perfectly capable of running business/es and making myself into a millionaire. A billionaire even. 5. I was able to focus on a number on the dice and roll it. When I really believed. But at the same time, when I had the opportunity of bagging £75 000 and going out, I became overwhelmed and stuffed it. It was what I thought I wanted but my subconscious took longer to agree – although it did come through on my second bite of the cherry. 6. It is easy once you understand the rules about passive income and cashflow. Money’s all a game really, even in real life. 8. We must be open to receiving. Sometimes it feels difficult to accept money, even when we’ve been paying into a kitty. Yet it’s easy to allow someone else to have it and we don’t judge them badly for taking it when offered. 9. I deserve it. And I deserve help from people – I don’t have to do it all alone. 10. If I feel defeated and focus on what isn’t working, I’ll get more of the same. 11. My money came from the market. From outside of me. It wasn’t just me plugging away and living off what I was making or selling. Money came from investments, opportunities, changes in the market, and selling my business. 12. I need to create and sell businesses. Find out more about straight-talking Creator Soozi Baggs at Tech-Changes.com and MaternityLeavers.com. Getting out seeing fabulous people is really invigorating. Thanks to Jeweller/Trader, Susie Jones, for those. I am sure there will be many more shared thoughts and feelings to come from the Club 100 and I shall definitely be organising more games for them and others in 2014. If you are not in the Club 100 yet would like to play Cashflow 101 with me in my garden office in South London, please contact me.